Friendly Reminder: Armistice Day / Veterans Day Observance at the HSRC at 11 am Today! At 11 am on November 11, 2018, exactly one hundred years after the end of fighting on the Western Front in World War I, bells across the United States will ring together as part of the special commemoration "Bells of Peace." 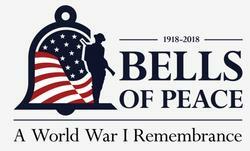 The Historical Society of Rockland County is participating in "Bells of Peace" to honor the 116,516 American men and women who died in World War I. "Bells of Peace," coordinated by the World War I Centennial Commission, was conceived and designed in collaboration with the nation's veterans of service with the Honor Guard at the Tomb of the Unknown Soldier. Bells will be tolled in communities across the nation - in places of worship, schools, town halls, public carillons, and cemeteries - to mark the centennial of the Armistice that brought an end to hostilities in what Americans fervently hoped was the "War to End All Wars." The nationwide program is designed to honor those American men and women who served one hundred years ago by providing a solemn reminder of their sacrifice and of the service of veterans of all wars. All are welcome to gather at the History Center at 10:45 am for the bell tolling at 11am sharp. The event will conclude at approximately 11:15am. For additional information about, and tools to conduct, "Bells of Peace" and other meaningful commemorations of the World War I veterans' service, visit the World War I Centennial Commission website at www.ww1cc.org/bells. This is a meet-up announcement for history enthusiasts. All are welcome! In April-September 2018, the HSRC's ROCKLAND VOICES featured "Remembering World War I." To view the virtual exhibition, click here or on the image above.